Arbor Vitae Arboriculture are proud to have planted far more trees than we will ever cut down. Good knowledge of how trees grow and thrive, and what harms them, is essential in tree planting. We have years of experience and professional training in this area, and tree planting work usually begins with a site assessment to determine which trees would be most suitable for the soil, exposure level and geographic area. It’s not just a case of digging a hole and throwing soil back in! This may seem to work for a while, but the tree may only survive for a few years. 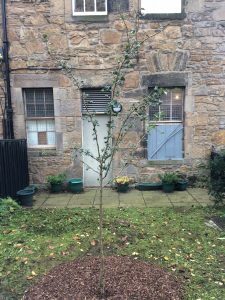 We source, deliver and plant trees to BS8545 – ‘Trees: from nursery to independence in the landscape – Recommendations’. Many trees that have been looked after in tree nurseries may die soon after planting due to poor planting and aftercare. Arbor Vitae Arboriculture always recommend a programme of aftercare for new trees, to help them establish successfully. This would include formative pruning, watering (depending on the size of tree and time of planting), removal of weeds and replacement of mulch. Accidental damage and vandalism can be an issue too, therefore we can build a basic protective cage to stop passers-by snapping the tree or its branches. It can be relatively easy to deter vandals by creating a simple obstacle. 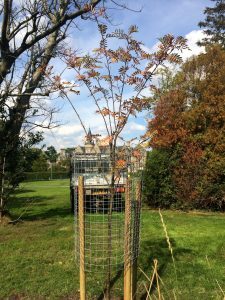 Planting a new tree can be relatively inexpensive (when the cost is calculated over its projected lifespan) however the cost of tree planting increases exponentially depending on the size of the tree. Trees from sapling size to around 4-5 metres can be planted by hand but anything bigger would probably require machinery (sometimes a crane) to lift them into place. In any case, the experience of planting a new tree is a very positive one. There are so many species of trees available that there will always be one that you can enjoy, whether it is for the colours of the leaves or flowers, for the harvesting and eating of the fruit, for shade, to soak up groundwater, to add structure to your garden, to increase wildlife in your garden, or simply to know that you have done a good thing for the environment. Contact us to help establish your new trees.